Leaked air traffic control audio files obtained by The Middle East Eye (MEE) have revealed involvement of Emirati fighter jets and pilots at the side of Marshal Khalifa Haftar who is opposed to the UN-backed unity government in Tripoli. MEE had previously reported the presence of the UAE alongside international forces from the US, France, UK and Italy. They provide support to Haftar’s forces on the ground in Benghazi, from operation rooms but Abu Dhabi has always denied any involvement in the Libyan war. “Your entry is going to be at the front which is going to be just as you go right again, go right… okay… stay on that target, stand by for update,” he is told by the operations room. The recordings, assumes MEE, took place at Benina air base in Benghazi and appear to be routine operations which took place between March and early May this year, between 10pm and 5am. 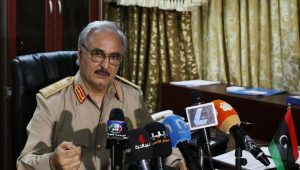 Haftar rose to the rank or Marshal on Wednesday after snatching Libya’s oil crescent from UN-backed government in a controversial move which stunned and infuriated western powers supporting Prime Minister Faiez Serraj’s cabinet. In a recent interview with Russian Sputnik, Haftar mocked the UN Special mission in Libya and the unity government’s military gains in Sirte against IS. He also boasted military support from Egypt, Chad and intelligence assistance provided by western powers. UAE has been accused of breaching the UN arm embargo imposed on the North African country after it appeared that Abu Dhabi supplies Haftar and his political ally, the Tobruk-based House of Representative (HoR) with armored personnel carriers. The Gulf country’s involvement in Libya is an open secret to everyone. Last year, former UNSMIL Head Bernardino Leon was caught up in a scandal after leaked cables revealed that he secretly received instruction from Abu Dhabi to back one side in the Libyan talks though he feigned neutrality. The Spanish diplomat additionally received a job contract with a fat check of $46,000 per month job for the position of Director of Emirates Diplomatic Academy. Written by: Jaber Ali on September 16, 2016. Posted by Jaber Ali on Sep 16 2016. Filed under Headlines, World News. You can follow any responses to this entry through the RSS 2.0. Both comments and pings are currently closed.